Renowned blues/rock guitarist Kenny Wayne Shepherd is heading back to his southern roots. 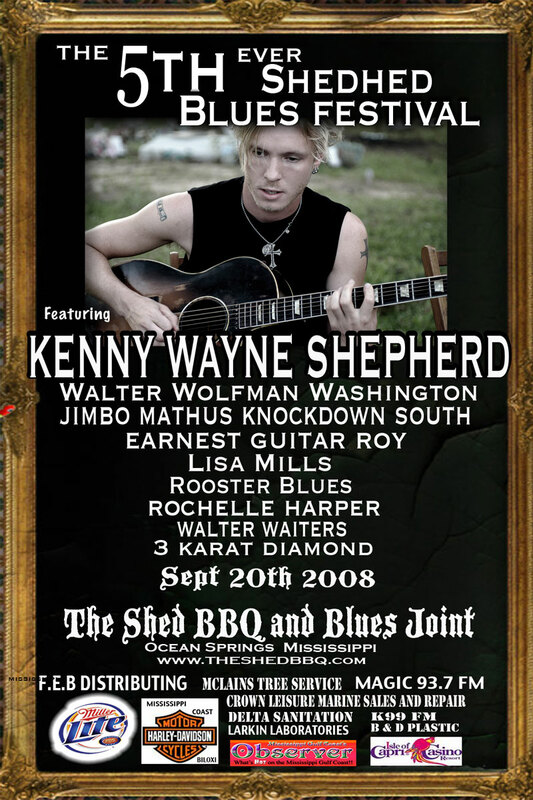 On September 20, 2008 Kenny Wayne will headline the 5th annual Shedhed Blues Festival in Ocean Springs, Mississippi. 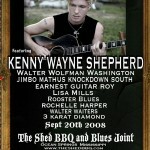 The 5th ever Shedhed Blues Festival will take place at the award winning Shed BBQ and Blues Joint, 7501 Highway 57, Ocean Springs, MS. Tickets will be $25.00 and will go on sale on August 10, 2008 at The Shed. To celebrate its fifth year, The Shed has added a second stage for acoustic performances. Other artists appearing at the Festival this year will be Walter Wolfman Washington, Ernest Guitar Roy, Jimbo Mathus Knock Down South, Lisa Mills and many more. Prior Festivals have included Big Joe Turner, The North Mississippi Allstars, Bobby Rush, James Blood Ulmer, Coco Robicheaux, The Burnside Family, T Model Ford, Grayson Capps, and Kipori “Babywolf” Woods. About Kenny Wayne Shepherd: Kenny Wayne Shepherd is a four time Grammy nominated, platinum selling artist with four No. 1 blues albums to his credit, including Billboard Magazine’s # 1 Blues Album of 2007, a string of No. 1 mainstream rock singles, two Billboard Music Awards, two Orville H. Gibson Awards, the Blues Foundation’s Keeping The Blues Alive Award, and a Blues Music Award. The Shed BBQ and Blues Joint is an award winning BBQ restaurant and music venue. 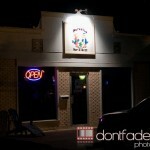 The Shed is known for its “Down Home Southern BBQ” and its eclectic taste for live Blues on Friday and Saturday nights. The Shed won two first place trophies at the world championship of BBQ at Memphis in May 2008 and were voted Best Pork Sandwich in America 2001 by the National BBQ News Magazine.